Pascal Démoulin at Observatoire de Paris and Sergio Dasso at IAFE–DF–DCAO. Coronal mass ejections (CMEs) are large structures containing plasma and magnetic field, originated from solar eruptive events. CMEs and related shocks propagate in the interplanetary medium, where they can be observed by in situ spacecraft instruments. In situ observations provide information on plasma and magnetic field properties only at the probe location. Such signatures are used to pragmatically define interplanetary CMEs (ICMEs, see review ). The front part of ICMEs is typically faster than the surrounding solar wind. As such, they are generally preceded by a sheath of compressed plasma and magnetic field, and the front edge of the sheath is typically a shock. Knowing the magnetic structure of an ICME is important to link it to its solar source, as well as to estimate some global MHD quantities such as magnetic helicity and energy [2,3]. Knowing the shock shape is also important to estimate their effects on the transport of energetic particles , to understand Forbush decreases  and to improve space weather forecasts of the Earth environment. Why do a statistical study? Deducing the 3D shape of a shock associated to an ICME requires multiple spacecraft. Indeed, in situ data only give local measurements along the spacecraft crossing. Yet, the occurrence of multiple spacecraft observing the same event is rare, and it remains difficult to know the general shape of shocks, as well as ICMEs. However, one single spacecraft, over its mission period, is bound to cross a fair amount of ICMEs. Furthermore, this spacecraft would detect ICMEs at random locations along the structure, since eruptive events occur with a large range of solar longitudes and latitudes. We use this property to deduce a mean shock shape from a statistical approach. How to derive a mean shape? The following presents the steps to determine general geometries of interplanetary structures, and in particular ICME shocks. Investigating the shock shape requires a proper geometry parameter definition. The shock normal is defined by the inclination angle i on the ecliptic and the location angle λ (Figure 1). 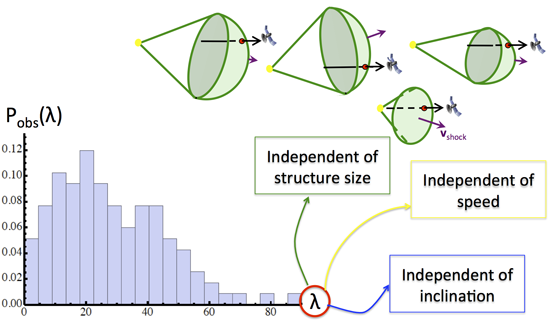 These angles are obtained from models fitting in situ data (e.g. Rankine-Hugoniot method). A uniform distribution for i is indicative of a shock shape invariant by rotation around the Sun-apex line. Since the angle λ is related to the shock shape (Figure 1a), the observed distribution Pobs(λ) (see Figure 2) is used to derive the mean shock shape. Figure 1: (a) Model of a CME shock propagating away from the Sun. (b) Schematic representing the inclination angle i and the location angle λ defining the orientation of the shock normal. These angles are defined in the geocentric coordinates (GSE). B. Do all shocks have a similar shape? An important hypothesis of the statistical analysis is that all the shocks have a similar shape. Is this true? Wouldn’t the speed, the size, or even the propagation orientation influence this shape, and therefore the observed distribution of angle λ (Figure 2)? To verify this assumption, we need to check that the shape of the observed distribution Pobs(λ) is not dependent on any of the shock/CME parameters (i.e., no correlations between λ and these parameters). This can be studied by analysing sub-groups of shocks having closer shock/ICME parameter values. Then, no correlation between λ and other parameters supports the fact that the analysed shocks have comparable shapes. Figure 2: Histogram for the probability distribution of the location angle λ from a sample of 257 observed shocks at 1 AU (see section Example). The question that immediately rises is whether this sample can be studied as a whole: do all different shocks illustrated at the top have a similar shape, although with different sizes/speeds? The observed probability distribution Pobs(λ) can be directly used to deduce a mean shape. We first assume a rotational symmetry around the Sun-shock apex line (in agreement with the observed shock properties being independent of the inclination angle i). Then, with the statistical results obtained from the in situ observations, the coordinates defining the location of the spacecraft crossing can be expressed as integral functions of Pobs(λ). This direct integration method allows us to derive the mean shape of shocks from the analysis of their statistical properties. These results can be compared with heliospheric imagers. However, doing so requires cases where ICMEs are well defined and observed with favourable conditions, as the shape deduced from imagers is model-dependent. 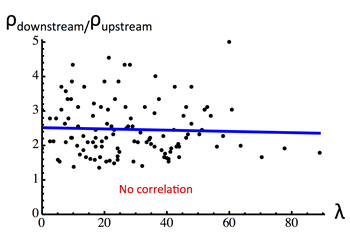 Figure 3: Example correlation graph between the ratio of the downstream and upstream densities and the angle λ for a sample of detected shocks. Generally, the study  shows that there is no correlation between the angle λ and other shock and ICME related parameters, validating the statistical methods to derive the mean shock shape (Figure 4b). As an example, we take a sample of 257 ICME shocks detected by ACE at 1 AU over a period of 10 years . We found no correlations between λ and other shock parameters (e.g. with the upstream/ downstream ratio, see Figure 3). Applying our statistical method, we found the mean shape of shocks related to the distribution function of λ (dashed line on the left of Figure 4b), and we compared the mean shape with heliospheric images of an ICME imaged by STEREO A/H1 . In Figure 4b, we show the reported shape at different times during the propagation, and in dashed line the result found with the in situ data. Such shapes (coloured lines) correspond remarkably well to the mean shock shape deduced from in situ data (dashed line). This technique can also be applied to other propagating structures. In  for example, we have applied a similar method to deduce the mean shape of the flux rope axis of magnetic clouds (they are sub-classes of ICMEs, and are defined by a strong rotating magnetic field indicating the existence of a flux rope). Such a method however has to be adapted to the geometry: in the case of a flux rope axis, the shape is a curve, while for a shock, the shape is a surface. Then, the direct integration of Pobs(λ) gives different expressions depending on the shapes considered. Interestingly, the mean axis shape is comparable to that obtained for shocks (Figure 4b), although the determination of the flux rope axis and the shock normal are based on different technics and different in situ data. Coronagraphs and heliospheric imagers give a general idea of ICME/shock shapes but they cannot fully determine them since they provide only a 2D projection. In situ single spacecraft data can then be exploited with a proper statistical analysis to deduce the general shape of structures propagating in the interplanetary medium. We first check that the observed distribution function Pobs(λ) has robust characteristics within sub-groups of structures, ensuring the existence of a common shape. Then, from Pobs(λ), we deduce the mean shape of these interplanetary structures by using a direct integration of the distribution (another method using synthetic distributions is also detailed in ). Independently, the shapes can be deduced from heliospheric images with other different hypothesis and modelling. The successful comparison between these independent methods ensures the validity of the results. These new statistical methods are presented with more details in  for magnetic clouds and in  for ICME shocks.